The physical nature of a frequency shift of hydrogen valence vibrations in a water molecule due to its interaction with neighbor molecules has been studied. Electrostatic forces connected with the multipole moments of molecules are supposed to give a dominating contribution to the intermolecular interaction. The frequency shift was calculated in the case where two neighbor molecules form a dimer. The obtained result is in qualitative agreement with the frequency shifts observed for water vapor, hexagonal ice, and liquid water, as well as for aqueous solutions of alcohols. This fact testifies to the electrostatic nature of H-bonds used to describe both the specific features of the intermolecular interaction in water and the macroscopic properties of the latter. D. Eisenberg and W. Kautzman, The Structure and Properties of Water (Oxford Univ. Press, Oxford, 1968). F.H. Stillinger and C.W. David, J. Chem. Phys. 69, 1473 (1978). J.-M. Andanson, J-C. Soetens, T. Tassaing, and M. Besnard, J. Chem. Phys. 122, 174512 (2005). P. Golub, I. Doroshenko, and V. Pogorelov, Phys. Lett. A 378, 1937 (2014). L.L. Shipman and H.A. Scheraga, J. Phys. Chem. 78, N 9, 909 (1974). L.M. Babkov, G.A. Puchkovskaya, S.P. Makarenko, and T.A. Gavrilko, IR Spectroscopy of Molecular Crystals with Hydrogen Bonds (Naukova Dumka, Kyiv, 1989) (in Russian). U. Buck and F. Huisken, Chem. Rev. 100, 3863 (2000). S.-B. Zhu, S. Singh, and G. Wilse Robinson, J. Chem. Phys. 95, 2791 (1991). V.Ya. Antonchenko, A.S. Davydov, and V.V. Ilyin, Fundamentals of Physics of Water (Naukova Dumka, Kyiv, 1991) (in Russian). H.J.C. Berendsen and G.A. van der Velde, in Proceedings of the Workshop on Molecular Dynamics and Monte Carlo Calculations of Water, edited by H.J.C. Berendsen (CECAM, Orsay, 1972), p. 63. P. Barnes, J.L. Finney, J.D. Nicholas, and J.E. Quinn, Nature 282, 459 (1979). R.L. Fulton and P. Perhacs, J. Phys. Chem. A 102, 9001 (1998). M.D. Dolgushin and V.M. 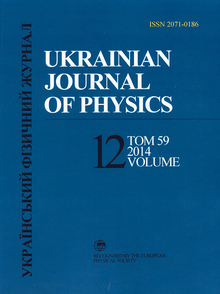 Pinchuk, Preprint ITF-76-49P (Instutute of Theoretical Physics, Kyiv, 1976) (in Russian). P.V. Makhlaichuk, M.P. Malomuzh, and I.V. Zhyganiuk, Ukr. Fiz. Zh. 57, 113 (2012). G.C. Pimentel and A.L. McClellan, The Hydrogen Bond (W.H. Freeman, San Francisco, 1960). J.O. Hirschfelder, Ch.F. Curtiss, and R.B. Bird, Molecular Theory of Gases and Liquids (Wiley, New York, 1967). W.L. Jorgensen, J. Chandrasekhar, and J.D. Madura, J. Chem. Phys. 79, 926 (1983). V.I. Poltev, T.I. Grokhlina, and G.G. Malenkov, J. Biomol. Struct. Dyn. 2, 413 (1984). I.I. Adamenko, L.A. Bulavin, V. Ilyin, S.A. Zelensky, and K.O. Moroz, J. Mol. Liq. 127, 90 (2006). L.A. Bulavin, A.I. Fisenko, and N.P. Malomuzh, Chem. Phys. Lett. 453, 183 (2008). M. Rieth, Nano-Engineering in Science and Technology: An Introduction to the World of Nano-Design (World Scientific, Karlsruhe, 2003). H. Berendsen, J. Postma, W. Van Gunsteren, and J. Hermans, in Intermolecular Forces, edited by B. Pullman (Reidel, Dordrecht, 1981), p. 331. T. Urbic and M.F. Holovko, J. Chem. Phys. 135, 134706 (2011). S.V. Lishchuk, N.P. Malomuzh, and P.V. Makhlaichuk, Phys. Lett. A 375, 2656 (2011). R.O. Watts, Chem. Phys. 26, 367 (1977). I.V. Zhyganiuk, Ukr. Fiz. Zh. 56, 225 (2011). O. Matsuoka, E. Clementi, and M. Yoshimine, J. Chem. Phys. 64, 1351 (1976). T.R. Dyke, K.M. Mack, and J.S. Muenter, J. Chem. Phys. 66, 498 (1977). Yu. Jin and Sh.-i. Ikawa, J. Chem. Phys. 119, 12432 (2003).